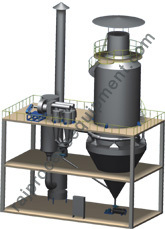 Spray dryers are offered for feeds in liquid form containing either water or any other solvent. Feeds may be solution, slurry or emulsion. Depending on the particle size of the final product required and the nature of feed any one or combination of following atomization system is used. High pressure single fluid atomization. 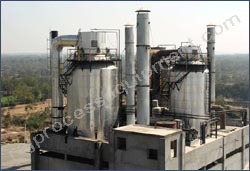 The final product obtained from spray dryer is in powder form. By varying the operating parameters of the spray dryer the required powder characteristics such as moisture, particle size, bulk density, flowability, Particle Morphology etc. can be achieved. Besides manual and semi-automatic systems we offer PLC & SCADA based systems for easy operation and monitoring of spray dryer. Multiple systems can be operated from a single computer thus reducing the manpower requirement. All the important parameters like temperatures, pressures, flow etc. are recorded and displayed in the system and can be retrieved at any given moment. Capacity: The spray dryers having water evaporation capacity ranging from 1kg/hr to 18,000 kg/hr can be offered and supplied. Operating temperatures: The spray dryers having operating temperatures up to 1100°C can be offered and supplied. CIP Systems: We offer integrated cleaning in place (CIP) systems in the spray dryers for automatic and fast cleaning of the complete system. This feature is essential where multiple products are dried in a single system and frequent washing is required. Typical applications of spray dryer are Dyestuffs, pigments, starch, detergents, milk powder, fruits, pharmaceutical, herbal extracts, food flavors, ceramics, china clay, enzymes etc.